Try something different the next time you're making a grilled cheese sandwich. We're talking bacon. Mushrooms. Swiss cheese. Yeah—that kind of different. Cook bacon in medium skillet until crisp; drain on paper towels. Discard all but 1 tsp. drippings from skillet. Add mushrooms and barbecue sauce to reserved drippings; cook and stir on medium heat 5 min. or until mushrooms are tender. 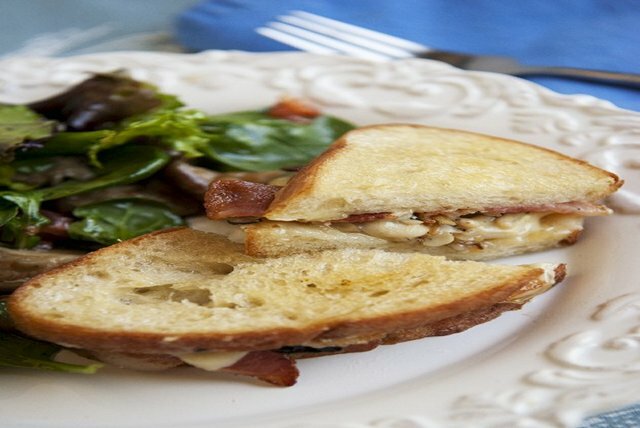 Fill bread slices with bacon, mushrooms and cheese. Spray both sides of sandwich with cooking spray. Cook in same skillet 3 min. on each side or until cheese is melted and sandwich is golden brown on both sides. Serve this grilled cheese that's perfect for an adult palate with fresh fruit to round out the meal. Prepare using a Kraft Singles Swiss Cheese Slice.